Funeral service for Nettie Irene Harris, 93, will be held at 11:00 A.M. Thursday, September 17, 2015 at the First Christian Church in Wheatland, Wyoming with Pastor Andy Gudahl officiating. Interment will be in the Wheatland Cemetery. Nettie Harris died Monday, September 14, 2015 at the Davis Hospice Home in Cheyenne, Wyoming. Nettie was born February 18, 1922 in Maysdorf, Wyoming the daughter of Eldridge and Carrie (Burnett) Broyles. She grew up on a ranch that her parents had homesteaded 30 miles from Gillette, Wyoming. She was educated in Campbell County and following her graduation from high school she received normal training to become a country school teacher. Following a year of teaching in Campbell County she moved to Omaha, Nebraska to work. She also worked a summer at Yellowstone Park in Wyoming. During World War II she worked in Laramie, Wyoming making radio parts. She was married to Harold Harris on May 10, 1948 in Sheridan, Wyoming and resided in Gillette. In November, 1953 they moved to a farm near Wheatland. They had four children, David, Karen, and twins, Steven and Stanley. They moved to Chugwater, Wyoming in 1974 and at the time of her death she had been residing in Cheyenne. Nettie was known for her values of honesty and hard work. She loved having her children and grandchildren at her home for any occasion that would bring them together. Nettie enjoyed growing flowers, especially roses, bird watching, and hearing the meadowlarks in the morning. 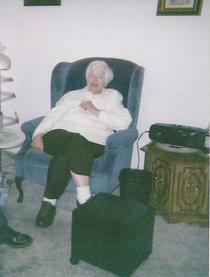 Nettie is survived by her children, David (Dorothy) Harris of Linn Creek, Missouri, Karen Vallee of Cheyenne, Steve (Debbie) Harris of Wheatland, and Stanley (Virginia) Harris of Wheatland; brothers, Richard (Lorraine) Broyles of Torrington, Wyoming and Warren (Rae) Broyles of Lusk, Wyoming; seven grandchildren; and nine great grandchildren. She was preceded in death by her parents; husband, Harold Harris, on June 2, 1998; and sister, Edith Mills. Serving as pallbearers will be Alex Harris, Sandy Harris, Matt Harris, Sara Stearns, Ryan Harris, and Keyth Lisenbee. A memorial to the American Cancer Society, 333 Beech Street, Casper, Wyoming 82601 would be appreciated by the family.